Have you ever done a headline prediction and had someone say, "If you knew that was going to happen, then why didn't you try to stop it?" Now you can apparently change the future and save lives, by stopping things you have foreseen from happening! This is a proven method that Devin Knight has used. It is the same method that caused an audience to give him a two-minute standing ovation for saving a person's life. The effect is tied in with any headline prediction you are doing for publicity. The press is there to cover your predictions. However, a prediction turns out to be wrong. You then proved that the prediction was wrong, because you changed the future, and as a result, saved a man's life! You offer infallible proof that you changed the future. Proof that will stand up to the most ardent investigations by skeptical reporters. Proof that can result in fantastic publicity, proclaiming you to be a psychic hero. It is well worth the effort it takes to pull off this amazing stunt, because this publicity stunt can result in talk show appearances on both local radio and television stations. The amount of favorable publicity this stunt will generate is priceless. It is one of the most unusual publicity stunts ever devised and was endorsed by Al Mann. In this publication, Devin gives you all the details you need to know in order to duplicate his stunt. 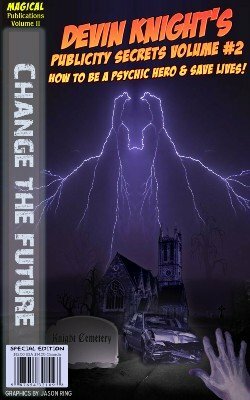 With the information in this release, you can become a psychic hero in the public's eyes. No pipe-dreams, but a real-world workable method that has withstood the test of time. Revised edition 2012, 11 pages.